A recent market study published by Persistence Market Research – “Rosacea Therapeutics Market: Global Industry Analysis 2013-2017 & Forecast 2018-2026” consists a comprehensive assessment of the most important market dynamics. On conducting a thorough research on the historic as well as current growth parameters of the Rosacea therapeutics market, growth prospects of the market are obtained with maximum precision. The report features unique and salient factors that may make a huge impact on the development of the Rosacea therapeutics market during the forecast period. It can help market players to modify their manufacturing and marketing strategies to envisage maximum growth in the Rosacea therapeutics market in the upcoming years. The report provides detailed information about the current and future growth prospects of the Rosacea therapeutics market in the most comprehensive way for the better understanding of readers. The rosacea therapeutics market is highly fragmented owing to patent expiry and generic penetration by vendors who are competing on the basis of market penetration and pricing. However, the consolidated nature of the rosacea therapeutics market has increased the profitability of the business owing to advanced formulations. The growing awareness regarding rosacea therapeutics and surging geriatric population have created lucrative growth opportunities for the players operating in the rosacea therapeutics market. Pfizer Inc., Teva Pharmaceutical Industries Ltd., Mylan N.V., Foamix Pharmaceuticals Ltd., and Bayer AG hold more than 50% revenue share in the global rosacea therapeutics market. The growth of the global rosacea therapeutics market is primarily driven by growing prevalence of rosacea and geriatric population. The development of healthcare infrastructure around the world is also expected to drive the growth of the rosacea therapeutics market. The increasing screening rates as well as geriatric population are the critical drivers of the rosacea therapeutics market. According to the National Rosacea Society, rosacea affects an estimated 415 million people worldwide. The general population suffering from rosacea are estimated to be 2.5–5.5%. Extrapolating based on an estimated global population of 7.6 billion, yields a number of 181,640,000 to 414,960,000 people suffering from rosacea worldwide. The statistics also state that 16 million Americans suffer from the signs and symptoms of rosacea, and millions more may be in temporary remission. According to the Canadian Dermatology Association, rosacea affects over three million Canadians. Thus, the growing number of people being affected from rosacea is projected to surge the growth of the market for rosacea therapeutics. The use of these off label drugs for the treatment of Rosacea has been taking place despite warnings from the European Medicine Agencies and the Food and Drug Administration due to poor validation and lack of efficiency and effectiveness. There has been a host of approvals for Rosacea therapeutics by FDA and other agencies which has generated a lot of market enthusiasm. A topical form of the alpha-2 agonist brimonidine was approved by the FDA in August 2013 for treatment of erythema associated with rosacea. Another topical alpha agonist, oxymetazoline, was approved in 2017 for persistent facial erythema associated with rosacea in adults. Topical ivermectin (Soolantra) has been approved by the FDA for treatment of the inflammatory lesions of rosacea. In 2017, FDA approved RHOFADE (Oxymetazoline Hydrochloride) Cream, 1% For The Topical treatment of persistent facial erythema associated with rosacea in adults 19, 2017. Food and Drug Administration (FDA) also granted tentative approval for Zenavod (doxycycline) capsules for the treatment of inflammatory lesions (papules and pustules) of rosacea in adults. The growing adoption of cosmetics and the hypertensive population also drives a large market for rosacea. Rosacea incidence also increases with age as most patients are over age 30. The growing number of young who smoke also drives the incidence rates of Rosacea. The growing healthcare infrastructure as well as healthcare expenditure of Europe, which accounts to average 10% of GDP, are factors driving the growth of the Europe Rosacea therapeutics market. Other European nations with a sizeable Rosacea therapeutics market are France, the U.K., Italy and Spain. Competition section of the Rosacea therapeutics market features profiles of key players operating in the industry based on their market shares, differential strategies, product offerings, marketing approach and company dashboard. Some of the key players operating in the Rosacea therapeutics market include Pfizer Inc., Teva Pharmaceutical Industries Ltd., Mylan N.V., Foamix Pharmaceuticals Ltd., Bayer A and Janssen Pharmaceuticals, Inc.
Rosacea is a common skin condition characterized by redness and visible blood vessels on the face. The nose and cheeks are the most affected regions. The signs and symptoms of Rosacea are small, red, pus-filled bumps which may flare up periodically. About half the patients experience eye dryness, irritation and swollen, reddened eyelids. Other symptoms include enlarged nose, thickening the skin on the nose, (rhinophyma). Rosacea predominantly affects middle-aged women having fair skin. FMI conducted a research study on Rosacea therapeutics market for the forecast period 2018 to 2026. 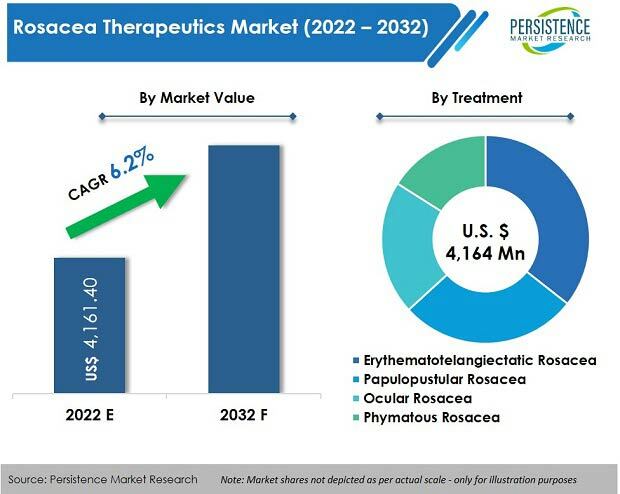 The Rosacea therapeutics market report offers a comprehensive evaluation of the business opportunities prevailing in the Rosacea therapeutics market along with insights on the Rosacea therapeutics consumption trend, disease incidences, and awareness level for Rosacea therapeutics market competition. The report elaborates on the macroeconomic factors influencing the dynamics of Rosacea therapeutics market and its futuristic potential. The report offers a comprehensive taxonomy of Rosacea therapeutics market based on drug class, distribution channels and region. The drug class segment of the Rosacea therapeutics market includes antimicrobials, alpha agonists, retinoid and others. The distribution channel segment of the Rosacea therapeutics market includes institutional sales and retail sales. The institutional sales includes hospital pharmacies, and clinics. The retail sales includes retail sales, retail pharmacies, drug stores and mail order pharmacies. The Rosacea therapeutics market has been analyzed across regions of North America, Latin America, Europe, Asia Pacific and MEA. What is the revenue potential of point of care Rosacea therapeutics across regions of North America and Europe? Who are the key competitors and what are their portfolios in Rosacea therapeutics market? What are major challenges influencing the growth of Rosacea therapeutics market? How intervention from regulatory authority is shaping the Rosacea therapeutics market growth? The Rosacea therapeutics market has been estimated based on supply-demand approach. The market was first calculated based on incidence and diagnosis rate, conducted in different region/countries. Other qualitative factors analyzed during the estimation include treatment rates for Rosacea therapeutics, recurrence rate and others. This information is further validated with rigorous primary research (including interviews, surveys, in-person interactions, and viewpoints of seasoned analysts) and secondary research (including verified paid sources, authentic trade journals, and resourceful databases). The research study on Rosacea therapeutics market also includes top trends and macro as well as micro economic factors shaping the Rosacea therapeutics market. With this approach, the report on Rosacea therapeutics market anticipates the industry attractiveness of every major segment in Rosacea therapeutics over the forecast period.